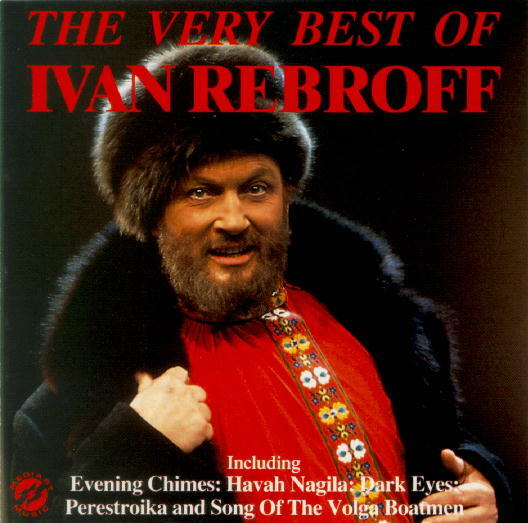 These two CDs were produced for the BBC to go with the BBC Radio 2 programme "Ivan Rebroff, The Russian Bear from Berlin"
Evening Chimes (Abendglocken) low notes(164K) high notes(202K). A good show of his range, but with a severe lack of consonants! Scarily, someone has done a house version of this tune (!). Poj Zyganka (Spiel Zigeuner). A traditional, whirling tune. , Song of the Volga Boatmen (Lied der Wolgaschlepper). Sombre traditional tune. Somewhere my love (Theme from Dr. Zhivago). A ballad. Ol' Man River extract(144K). American spiritual about the Mississippi. Im Tiefen Keller. Treated light-heartedly. Two White Doves (Zwei Weisse Wolken). Ballad. La Calunnia (Verleumdungsarie) - from "The barber of Seville". Opera. Perestroika. A more recent song celebrating the opening up of Russia. Ach Natascha. A whirling Russian tune in German. Grosser Alter Don. Another peon to a river. On the way from Petersburg to Novgorod. A ballad, but with James Bond balalaikas?! Dark Eyes (Otschi Tschornyie) (Swartz Augen). Sweeping tune. Cossack Patrol (Pojuschko-Polje). A stirring, galloping song. Schto Nam Gorje (Unbekemmert). A reflective song with a Spanish guitar background, that gets faster. This compact disk is © 1991 MOIDART Music Group Ltd. Licensed from Elisar Records, Offenburg, Germany. Code MDMCD 001. Barcode 5-022818-194608 also available as BBCCD 778. Information reproduced for review purposes.